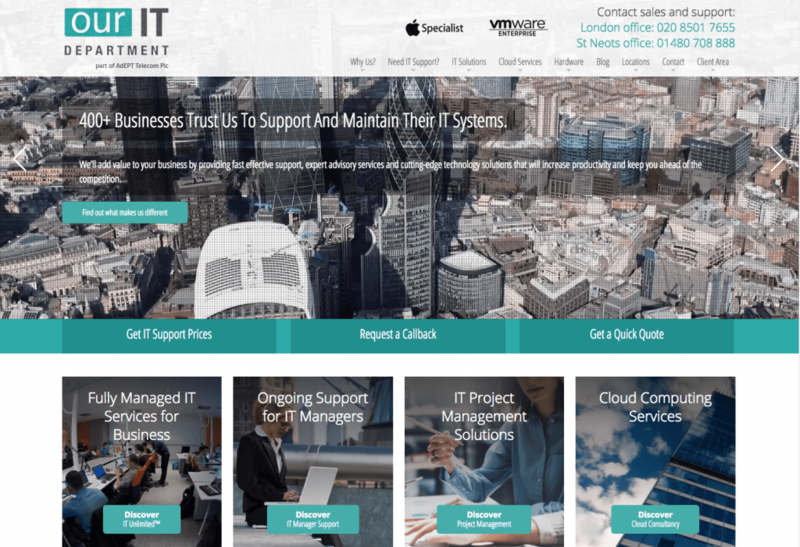 Our IT Department is a London based IT support company who specialise in providing IT support services to small businesses based in and around London. Boasting over 20 years experience, the company already delivers premium IT support services to over 400 companies and continually strives to improve the quality results they already achieve for clients. Our IT Department had been dealing with dropping visitor numbers to their website for the past five years, and found that they were losing potential customers to competitors (who were either copying the Our IT Dept website or expanding upon it). Therefore, they required an updated, modern website that would communicate to small businesses exactly who they are, where they are, and what they do, with the ultimate aim of increasing traffic and reducing the site bounce rate. Thunderbolt created a clean, professional-looking site for Our IT Department, aimed at being as clear and easy to follow as possible for users. The eye-catching design and smooth user journey worked so well that Our IT Dept actually saw more conversions within the first 12 months of the Thunderbolt-designed site going live than their previous website obtained across a period of five years!